A craft organizer can not only keep your craft supplies organized but it can also keep your room cleaner. You don’t have to buy a craft organizer. 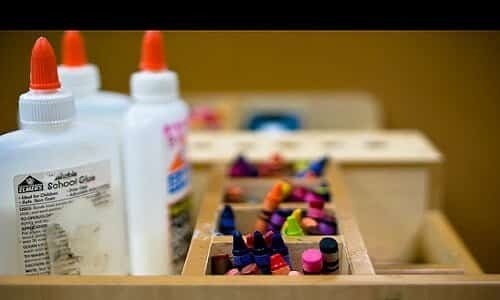 Instead, you can create a personalized craft organizer with the help of some cardboard boxes. Here are some items you will need to make a good organizer. Pick a strong lid and use it as the base of your craft organizer. The lid should be strong enough to hold all your craft supplies and dividers. If your shoe box’s lid is not strong enough then make it stiff with the help of a cardboard piece. Measure the lid’s width and length and cut out a cardboard piece of the same measurements. Paste this piece on the outer or inner side of the lid. You can pick the cardboard boxes of cereal, soap bars and various other items. Pick small as well as large boxes and place them on the inner side of the lid. Make sure all of them fit well with each other. Making this kind of adjustment might take a while. Once you have decided the place for each box, take a black marker and mark their space. Afterwards, take out the boxes and cut all their flaps. Decorate paste decorative paper or fabric on all the boxes. Also, paste a solid black paper or fabric on the outer side of the lid. Place all the cardboard boxes on the lid and you are done. Put all the craft items in the cardboard boxes. Pick a good craft desk and place your craft organizer on it. This will help you to keep your crafts items handy while making crafts. A craft desk can also help you to make your crafts without breaking your back. You can check out some mobile craft desks available at Walmart. They feature drawers and a lot of flat surface for craft making.